I'm hoping to break the restaurant curse by going to Al Vento next week. Where are you going for Restaurant Week? The other night, we ate at Pei Wei, which I tend to like (for a chain). It was their 10-year anniversary, and everyone there had the same thing we did — a coupon for 2 entrees for $10. They were moving people through pretty fast, and then we did the restaurant equivalent of crashing their server. All of a sudden, things just stopped, and the people before us, us, and the 5 parties after us all had to wait over an hour for our food. Nothing was coming out of the kitchen; they stopped the line of people waiting to order; time just stopped. Then suddenly we all got served and things picked back up. I don't fault them for being overwhelmed, but along the lines of my previous post, it would have been a much more enjoyable experience if they had done something about it. Come around to talk to us and update us. Offered coupons or free apps. Given Beatrix (who was a trooper, but starting to freak out) a tour of the kitchen. Anything. Sunday night (before Swell Season, which was awesome! ), we went out to the Uptown Cafeteria. I had heard mixed things, but was very happy with our meal. Though our reservation put us at an interior booth (and I really wanted a window), our cocktails were lovely, our food rich but good, and our waiter excellent. Score one for the home team! For years now, my dream car has been the A4 wagon. I loved the functionality of my Impreza, and drove it into the ground. I have loved the power and handling of my mom's A6 that I inherited, but I'm just not a big fan of sedans (or "cars with butts" as I call them). My A6 is still in great shape, and I love that it reminds me of my mom and all the Florida drives we did in it, but it's just never seemed right. 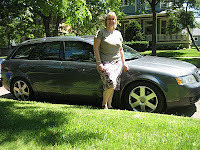 This last weekend I found the dream car — a dolphin gray A4 wagon, beautifully maintained, and very similar to my A6. I jumped on it — isn't it great? MILLY AND TILLIE opens at Open Eye Figure Theatre this Thursday 7/15, running Th-Sat nights at 7 through August 8. Half an hour long, designed especially for pre-school and under kids, and with free ice cream to follow — how can you go wrong? We'll be there on Thursday, and if I know Beatrix, we'll go back again at least one other time. See you there? Most of my time lately has been spent in looking for balance. Work, family, volunteer commitments, the house, personal life, professional development, friends — it's tough to put everything together!